On February 15, 1548 the Community of St. Barnabas was invited to intensify its preparation for Easter meditating on the two vineyards. "We need to diligently cultivate the vineyard of our soul, to eradicate all thorns, and to remove all stones which could hinder a full hundredfold yield. In so doing, with the fragrance of sweet virtues acquired with the help of our love, the sweet Christ, we will draw our neighbor to Christ." To be able to cultivate the vineyard ad our soul first of all our heart must become soft as wax so as "to receive the imprint of the voice" of the Lord, "piercing more than any sword." Secondly, "the soul must fast from vices, ambitions, presumptions, curiosities, anger, resent­ments, suspicions, pretenses, negligence, laziness, sadness, vane thoughts and words. quarrels, stubbornness, toughness in our opinions never wanting to yield to others, judgments, complains, desires for comfort and of being loved, and other imperfections"
Only if "we nourish ourselves with virtues and practice them" we can "spend our life, body and blood, for our neighbor, to whom we cannot give what we do not have, since no one can produce a fruit in others if he does not produce it in himself"
Only through a tireless tending of the vineyard of our soul can we "busy ourselves in the vineyard of the Lord, to make it yield a more abundant fruit." We have to make clear our desire for "the Lord to make use of us," and "lead us to his beautiful and sweet vineyard, so much in ruin in our days, devastated and badly tended, as you can see" As you can see! 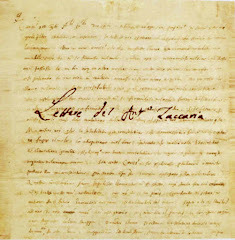 We should ask ourselves if our times are much different from that far away 1548, when from the monastery of "St. Paul Converted" by St. Eufemia in Milan, the Angelic Paola Antonia Negri was signing, addressed to the Brothers in St Barnabas, one of her 133 letters It reechoes a teaching very dear to our Holy Founder and often resumed during the reflections done by the members of the three Institutes gathered together for their "spiritual sharings" (Collazioni), or community meetings. "Let us first of all produce fruit in ourselves and then in Our Neighbor," was the slogan of their program. On the other hand, they did not miss the truth of the opposite, that is, "the more one dedicates himself to others, moved by the love of God, the more fullness of the spirit he receives." 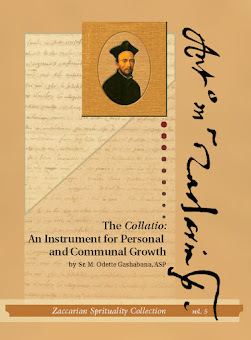 These texts of the Acts of the Community are matched by another thought by the Angelic Negri, "This privilege grants charity to those who labor for her, the grace not to lack that very good which they procure for others," so that "as we work in the others, Christ will work in us," and "to exert ourselves to win the souls of our brothers for Christ, will consume in us any imperfection." Did not Anthony Mary write to a missionary in Vicenza, I wish "she would try to make progress not only in herself, which would be very little, but also in the others" (Letter VI). 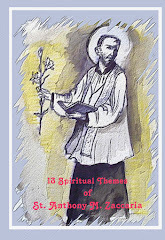 All the 13 Spiritual Themes of St Anthony M . Zaccaria were translated from Italian by Fr. Frank Papa, CRSP and edited by Ms. Fran Stahlecker.